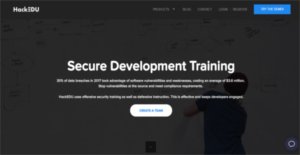 What is HackEDU Secure Development Training? HackEDU Secure Development Training is a series of software development lessons that combines offensive security training and defensive instruction, all of which are designed to help software developers create software that are free of vulnerabilities and weaknesses. Hackers exploit vulnerabilities in software to enter the user’s network and access critical information. With HackEDU Secure Development Training, software developers are trained to craft secure software and other applications and taught how hackers spot weaknesses in the system and infiltrate so they can make the necessary modifications to ensure hackers and other security threats won’t be able to access the client’s system and steal their data. HackEDU Secure Development Training provides you with software development lessons that will take you places. If you are a professional software developer or run a software development firm, you know how important it is to deliver software products that not only do what your clients demand but also protect them from data theft. 30% of data breaches that occurred in 2017 were because of existing vulnerabilities and weaknesses in software products. Total money lost due to data breaches in the past year amounted to $3.6 million. With HackEDU Secure Development Training, you can stop money bleeding out from your clients by creating secure software right from the start and delivering clients with products that meet compliance requirements. HackEDU Secure Development Training delivers interactive, hands-on and exercises around real applications. You don’t deal with simulated scenarios. You are developing real software and this is quite effective as you become enthusiastically engaged. All lessons are Browser-based and don’t require you to set up any hardware. Once you are good to go, training will immediately commence. All lessons are built from the hacker’s perspective. You will know how a hacker operates and spots vulnerabilities and weaknesses in your software so you can fix them right from the start. This is so much better compared to learning how to defend. Training takes time but with HackEDU Secure Training Development, you learn at your own pace so it won’t disrupt your roadmap. What Problems Will HackEDU Secure Development Training Solve? Companies often hire software developers that do not understand software vulnerabilities and how to code securely. This is the first step in the Security Development Lifecycle. It should be done every year to ensure vulnerabilities in the code are minimized. Additionally, the Secure Development Training helps meet compliance requirements of PCI, HIPAA, and NIST. There are popular and widely used applications in each software group. But are they automatically the best fit for your company’s unique needs? A market-leading software solution may have thousands of subscribers, but does it present what you require? For this reason, do not blindly invest in popular systems. Read at least a few HackEDU Secure Development Training reviews and think about the aspects that you wish to have in the software such as the fees, main features, available integrations etc. Then, shortlist a few systems that fit your wants. Try out the free trials of these apps, read online opinions, get information from the vendor, and do your research meticulously. This profound homework is sure to help you find the best software platform for your company’s special requirements. How Much Does HackEDU Secure Development Training Cost? We realize that when you make a decision to buy IT Security Software it’s important not only to see how experts evaluate it in their reviews, but also to find out if the real people and companies that buy it are actually satisfied with the product. That’s why we’ve created our behavior-based Customer Satisfaction Algorithm™ that gathers customer reviews, comments and HackEDU Secure Development Training reviews across a wide range of social media sites. The data is then presented in an easy to digest form showing how many people had positive and negative experience with HackEDU Secure Development Training. With that information at hand you should be equipped to make an informed buying decision that you won’t regret. What are HackEDU Secure Development Training pricing details? What integrations are available for HackEDU Secure Development Training? HackEDU Secure Development Training service is web based and works well on a variety of machines. If you need more information about HackEDU Secure Development Training or you simply have a question let us know what you need and we’ll forward your request directly to the vendor.